With the purchase of any Partner 900 PRO series translator you get the P900 Accessory Pack for FREE! Our speaking translators with massive vocabulary and interactive learning system! Best choice for language learners! Handheld voice activated translators with the handheld scanner! Scan and translate any text you want! Handheld Electronic Dictionaries and Translators are the modern answer to medieval paper dictionaries: fashionable, lightweight and portable language and communication solutions, they are fit for virtually any area of business. Here you will find over 140 titles for the unbelievable multitude of 48 languages, each offering a collection of awesome features, ready to back you in facing any language challenge. An electronic translator or electronic dictionary is a smart way to combat the uncomfortable linguistic uncertainties when traveling, studying languages, communicating with international business partners, and more. A number of our devices incorporate advanced Text-to-Speech and Speech Recognition technologies and carry additional functions of business organizers. Our electronic dictionary models offer a wealth of resources, such as extensive bidirectional vocabularies (up to 1,000,000 entries), voice recognition and/or synthesis, phrase banks containing colloquial expressions and common phrases, grammar references, as well as many pleasant extras. The translation software that you’ll find in this section is ready to serve you in over 48 languages. It provides a wide range of linguistic functionality to work under numerous circumstances. It will offer language instruction, be your study aids, offer full-text translation, deliver talking and non-talking dictionaries, provide localization, and all of it - running on the major platforms and OS including Windows, Pocket PC, Palm OS, and Smartphones. Our Line of eBook readers is probably the best choice for those who enjoy the pure reading experience without many extras. Our straightforward approach towards the design and functionality of the device has made it possible to keep the prices at an affordable level. Our readers are well built, light and capable of storing up to 32 GB of information and support most of the formats eBooks come in. The LCD display will keep your eyes rested. And, of course, each model has built-in dictionaries. ECTACO Partner 900 series devices are our newest and most powerful translating machines featuring the most extensive vocabulary yet with human voicing, a Full Text Translation system with advanced voice output, an easy to use bilingual translating Picture Dictionary, a complete English explanatory dictionary and our latest speech recognition system. These smart new translators contain everything you need for superior translation and accurate communication and much more. Our jetBook e-book reader has also been included as an additional benefit. In addition, exclusive User Dictionaries allow you to store your own personalized lists of frequently used words and a history function remembers your most recent translations to provide instant access to the information you need most to understand and be understood. Deluxe versions come equipped with a handy scanning pen allowing you to grab any printed text from any surface and have it converted into the target language. Our latest Partner 900 Grand series also include the GPS receiver which clips on to the unit and records its own position, time, date, speed, heading and altitude so you never lose your way. Special offer! 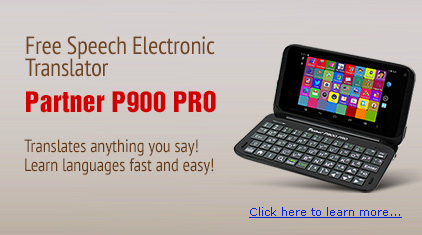 Buy any Partner 900 series electronic translator and get a P900 Accessory Pack ( CAD99.95 value) free! 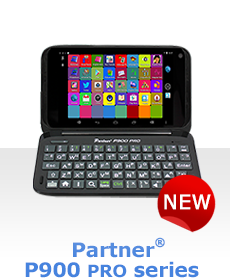 This Windows CE powered handheld is the smartest multilingual device from the remarkable Partner series that provides unlimited translation and communication possibilities and combines the most extensive language databases for French, German, Italian, Portuguese and Spanish. Capable of translating any text from English into any of these languages and back, this intelligent machine features True Voice human pronunciation of words and phrases. Our Language Teacher system with hands-free, eyes-free U-Learn? Car Tutor allows studying any language quickly and effectively. This multilingual EW900 model also supports the C-Pen/Ectaco handheld scanner which can be purchased separately if needed. With a massive 697,000 entry English <-> Arabic Translating Dictionary, an easy to use bilingual translating Picture Dictionary, a complete English explanatory dictionary and Full Text Translation, the remarkable new EA900 contains everything you need for superior translation and accurate communication. Exclusive User Dictionaries allow you to store your own personalized lists of frequently used words and a history function remembers your most recent translations to provide instant access to the information you need to understand and be understood. The all-new ER900 is quickly becoming one of our top bestsellers of all time thanks to its unbeatable flexibility. With a large colour LCD screen that offers unlimited access to the exceptionally comprehensive resources it contains, the ER900 is as good-looking as it is intelligent. Containing a massive bilingual translating dictionary, an intuitive 39-language picture dictionary, unparalleled voice capabilities and the world's most advanced Speech Recognition modules, it offer communication and learning opportunities that are second to none. The inclusion of a voice enabled Audio PhraseBook that speaks its 14,000 entries aloud using real human voice pronunciation and a built-in Language Teacher system let you learn and communicate in English or Russian as soon as you switch the ER900 on for the first time. In addition, Audio and Video players and an eBook reader are included to make the ER900 absolutely unbeatable when you demand the very best. Brand new software for Android! Ectaco Talking dictionaries, PhraseBooks and Language Learning apps for Android! This is a whole new line of talking dictionary software apps for Android operated mobile devices. The new apps do not require any internet connection so you can start using the software right after you download and register the product. Each app is available as a part of Ectaco suite so you get more functionality for less value. Combining a bi-directional translating dictionary with an extensive 400,000 word vocabulary Dictionary, a talking PhraseBook containing over 14,000 travel-oriented phrases divided into 15 of the most useful categories, our famous FlashCards language learning application to help you memorize new vocabulary and improve your spelling, and the most sophisticated full-text translator around to help translate emails, business letters, technical documentation, and WebPages - our recently released LingvoSoft Professional Suite 2019 covers every type of language use in one user-friendly and responsive package. Instantly turning your desktop or laptop PC into the most sophisticated personal language learning and communication assistant ever invented, it is truly one of a kind. Unique collections that include all LingvoSoft software for different languages are finally here. LingvoSoft Platinum Software Packs consist of advanced applications for all the devices you have now or will have in the future. If you are studying a foreign language, a businessperson dealing with foreign partners, or a frequent traveller abroad, this comprehensive package will cover your needs in a most convenient and cost-effective way. These software bundles are compiled of bidirectional and multilingual dictionaries, speech-enabled translation applications, software for travellers, etc. All major operating systems are supported. 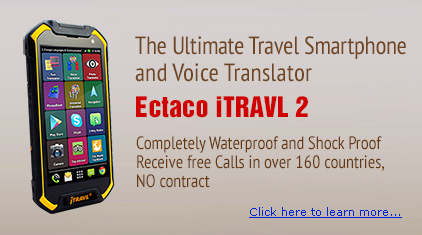 Ectaco, Inc. is the world leader in the development and manufacture of electronic handheld dictionaries and language translation software. An electronic dictionary is our leading product, our passion and our expertise. Since the foundation of the company in 1990 we have been helping people communicate better in over 30 languages. We focus on designing modern high-quality multilingual tools for wide consumer audience. Millions of people all over the world are using our electronic dictionaries - efficient tools for businesspeople and tourists, professional interpreters and students, a necessity for people residing abroad. We make advanced electronic translators enabling effective multilingual communication. In response to growing demands we expanded our worldwide presence and now have offices in 16 countries. In case if you need assistance choosing the right product or have technical questions, please feel free to contact our Customer Service and Technical Support respectively. Our dealers' network is constantly growing. Over the years we have developed cooperation with a great number of enterprises. Would you like to partner with us? For more information, visit the Dealer Section on our site.